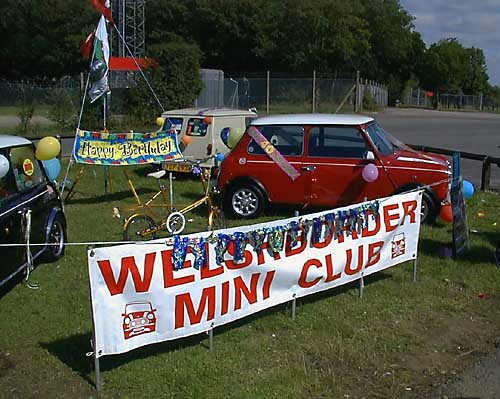 The 40th Birthday of the Mini (car) was celebrated at Silverstone on 21 and 22 August 1999. 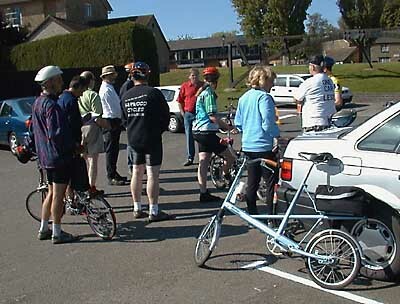 Dr Moulton designed the suspension for the Mini (and many other cars produced by BMC and its successors, including the Metro/Rover 100 and the MG F), so the Moulton Bicycle Club rode to Silverstone on 21st August to take part in the event. 13 riders turned up at Stoke Bruerne for the start of this ride, organised by Malcolm and Jenny Lyon, although two others were to join us later. Everyone except Jenny was riding a Moulton, with a good range of machines present - but no Minis, either Moulton or cars. There were two NS models present, one only having been delivered the day before. The ride to Silverstone was only about 8 miles, the first part being on quiet lanes, but more busy roads being encountered as we approached Silverstone, not unexpectedly containing an unusually large proportion of Minis. Over the final stages the bikes allowed us to go faster than the cars, which were being delayed by the volume of traffic. Photograph: Malcolm briefs the riders at the start. Photograph: Some of the riders on arrival at Silverstone. Silverstone was awash (rather a mixed metaphore) with Minis. 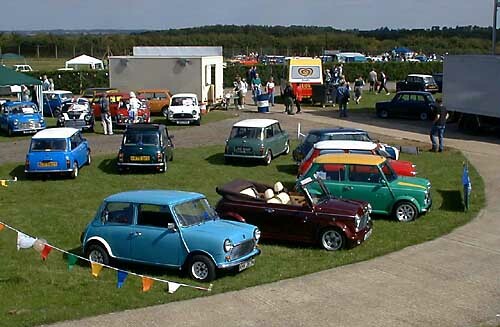 It was noticeable that a large proportion of these were quite recent cars, and higher specification versions (Coopers). Vans and pick-ups were not very visible, and nor were basic Minis which looked to be in regular daily use. 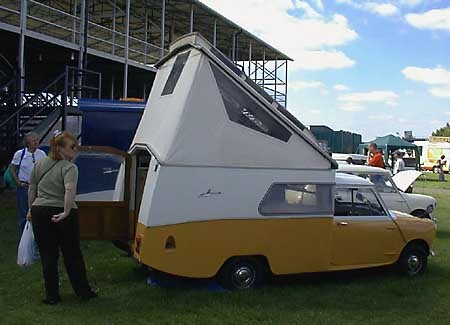 There were also very few Clubman-bodied machines, and those that there were seemed to be the up-market GT versions. Photograph: One of the display areas. At the circuit the bikes were very useful for getting around. However, other Moultons were not easy to find, and I only saw one display where the association was being acknowledged, with a Mini Moulton. 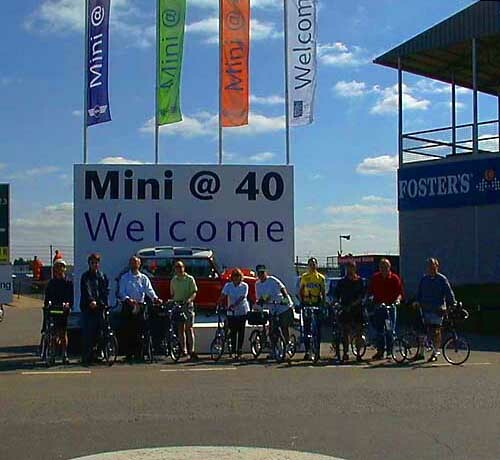 Judging by the comments I overheard as we were cycling round, quite a lot of people at the event did not know much about Minis, or they would have recognised the significance of the bikes. Dr Moulton himself was of course a special guest, but happily when he emerged from the Rover hospitality area he and Shaun found us, and Dr Moulton was obviously delighted to see the bikes and their riders. While we talked a number of overseas visitors, mainly Japanese and American, came over to mob Dr Moulton, showing a greater knowledge of Mini history than the local car enthusiasts (a prophet in his own country?). Unfortunately we missed the one Mini race, and the only racing available to be seen was not terribly interesting - you would have thought that for this event there would have been a larger Mini content in the racing program, but perhaps Sunday was better in that respect. We left soon after 4.00pm for a gentle ride back to Stoke Bruerne, and the cars. Tony Hadland very kindly offered me a lift back to the outskirts of Coventry, with Keith Findlay, and having seen Ian Wright arrive by car, with his Marathon strapped on the back of Malcolm's car, I did not feel too guilty about accepting the lift. I was very jealous of Chris Eley - not only does he have an NS Moulton, but also a Nikon Coolpix 950 camera, the successor to the Coolpix 900 used for these photographs - a camera with a lot of additional features to mine. Many thanks to Malcolm and Jenny Lyon for organising such an enjoyable day.